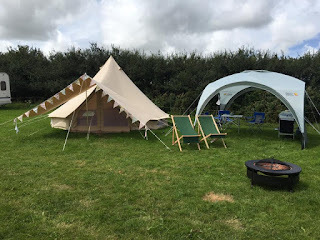 Menallack Farm offers a wonderful camping, touring and glamping experience in Treverva, Cornwall. Our family run site near Penryn is perfect for lovers of the great outdoors. We are in a beautiful location and ideal for exploring Falmouth and a range of great attractions. Our beautiful and secluded campsite is fortunate to have 1½ acres of lush countryside to enjoy. Breathtaking views can be admired throughout the site. We have 10 grass pitches available for tents and motorhomes. We also have an overflow field available for tent pitches. Pitches for motorhomes and a static caravan are available as well. You can enjoy that added bit of luxury in our glamping field. We have 3 bell tents, 2 pods and a caravan. Our bell tents are beautifully furnished and come with beds and comfy seating. Menallack Farm makes almost half of the cheeses in Cornwall. Please do visit the shop where you can buy or just try, our range of chesses or other Cornish treats and delicacies. Trips to see the cheese rooms can be arranged with prior notice. Dogs are welcome if kept under reasonable control. There is ample space for their exercise if required. We are in an excellent position to explore a range of superb attractions. Only two and a half miles from our site are both Tebah Gardens and Glendurgan Gardens. The nearest beach is only 3 miles away and we are within easy reach of many towns, resorts and attractions on the north and south Cornish coasts.